I used a kit made by me called Autumn Retreat, which you can purchase at any of the stores I sell my products in. 3. Open papers 4, 9, 10 & 11 from scrap kit. Right click and choose ADD ALPHA CHANNEL on each layer. Next, right click on the Jenny Mask and choose ALPHA TO SELECTION then click on paper 11 layer and go to SELECT>INVERT and EDIT>CLEAR. This paper layer is now the mask so delete original mask. Repeat with the MC Mask and paper 4. Paper 10 will need that done with bigcirc layer of template, and for paper 9- merge top square layer of template with bottom square layer of template, and ALPHA TO SELECTION, SELECT>INVERT & EDIT>CLEAR. You can delete the layers from the template that you replaced with paper now. 4. Add as new layers the following elements from kit (from lower layers up), scale and place appropriately. 5. Open tube of choice. I used set 1 of Pretty Tracey by Ismael Rac. Delete all layers except orange bracelet, orange shirt and the light brunette hair. then merge those 3 layers. Duplicate this layer, but click the little eye next to it in layers box to make it invisible for a moment. Then flip the first layer and move above the midcirc layer of template and right click midcirc layer in layers box, ALPHA TO SELECTION then click on the tube layer to make it active. Go to SELECT>INVERT & EDIT>CLEAR. Then go up to the MODE arrow in layers box and choose OVERLAY. For the duplicate layer, scale to 175 x 446. 6. Add drop shadows to almost all layers... Go to FILTERS>LIGHT AND SHADOW>DROP SHADOW and levels at -2/2/2 and if you want you can add drop shadows to some layers with 2/2/2/ settings also. 7. 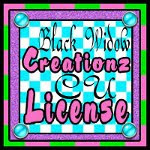 Add the correct copyright info to your tag, this artist requires a license number, so I wrote out the artist's name, website and license number. 8. For the name on this, I used a font called Pristina. I used an orange tone and added noise by FILTERS>NOISE> RGB NOISE with settings at 20/20/20/0 then right click in layers box and go to SELECT>GROW by 2. Add a new layer and fill with deep red. Add drop shadow. Then click on the original text name layer and go to FILTERS> DECOR>ADD BEVEL with thickness at 5. 9. Use the rectangle select tool to crop your image then go to IMAGE>CROP TO SELECTION. Save as .xcf so you can return if you need to make changes within the tag. Otherwise save it as .png when satisfied with outcome.